Owing to the expertise of our team of experienced professionals, we are able to introduce an exclusive range of Taekwondo Headgear. The offered headgear is manufactured using leather lining materials and applying latest techniques. The latest techniques is the double padding lining used making the headgear having four layers of thickness. 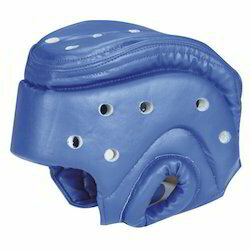 Thickness of the headgear is 2.20mn, which makes the robust and reliable during playing hours. Apart from this, clients can get the headgear purchase from us at industry leading rates. Looking for Taekwondo Headgear ?